Looking for quality traffic to your website, CPA offers or mobile app promotion? Welcome to the Signup or Login to view earning guides for mobile apps and websites. from PropellerAds! Global ad network PropellerAds is a #1 player in the popunder advertising industry. We started up in 2011 and are now delivering more than 400 million popunder impressions every day across web and mobile devices. Minimum deposit of only 100 USD! Sign up for an account with instant approval: Signup or Login to view earning guides for mobile apps and websites. Please note, we don't accept campaigns that contain explicit adult materials, any kinds of malware, fake virus alerts, "tech support" or other content that may harm our publishers and users. We offer ad inventory in nearly every GEO for all platforms, covering both desktop and mobile users. Our traffic estimator helps you see how a campaign’s bid and targeting settings change your ad’s reach. What ad units do you support? At the moment, Onclick Popunder is the only ad format available for managing via the Self-Service Platform. If you want to run a banner or mobile interstitial campaign, please contact us. What pricing model is offered? For self-serve campaigns, we offer CPM (Cost per Thousand Views) pricing. However, we do performance-based campaigns for customers who use our managed services. Yes, if your budget is at least $1000 and you want to put your campaigns in the hands of expert account managers, please contact us. Do you support conversion pixels? We provide some tracking variables (dynamic tags, tokens) that you can use to track conversions through your URL and your own tracking system. If you need a conversion pixel or postback, please contact our support team from your advertiser’s account. We are always glad to welcome new partners! If you are looking for fully-managed advertising services, other ad units (like banners, mobile web ads, video, etc.) or custom solutions, please Signup or Login to view earning guides for mobile apps and websites. We are happy to announce the first major update of our Signup or Login to view earning guides for mobile apps and websites..
From now advertisers can include or exclude the audiences that use the particular web browsers (both desktop and mobile). In order to help you run successful campaigns, we have released a conversion tracking feature. With PropellerAds conversion tracking, advertisers can monitor their campaign's performance by counting the number of actions performed by users. See detailed instruction how to use the conversion tracking in your advertiser’s account or in our Signup or Login to view earning guides for mobile apps and websites.. If you are experiencing any issues with the conversion tracking - please contact our support team or your account manager. More features coming soon, stay tuned! We've released some new features for advertisers! Now your campaign's stats update every minute! In the previous version it was once in 30 minutes. Also, we've added a bank wire transfer as a deposit funding option for advertisers with larger budgets. We still have some GEOs with low competition for desktop and mobile traffic (especially with targeting to users of tablet devices). If you have some offers like sweepstakes, pin-submits, binary options and other verticals - hurry up to buy quality popunder traffic through our Signup or Login to view earning guides for mobile apps and websites..
Don't forget, our support is available 24/7 to help you start and optimize your campaigns. We are happy to announce that finding the right audience for your offer is now easier. Take advantage of our new option for advertisers - targeting by users’ language! The Voluum team has added Propeller Ads as a predefined traffic source! Now advertisers and media buyers that use Voluum don’t have to spend time setting up parameters for PropellerAds postback URL anymore. 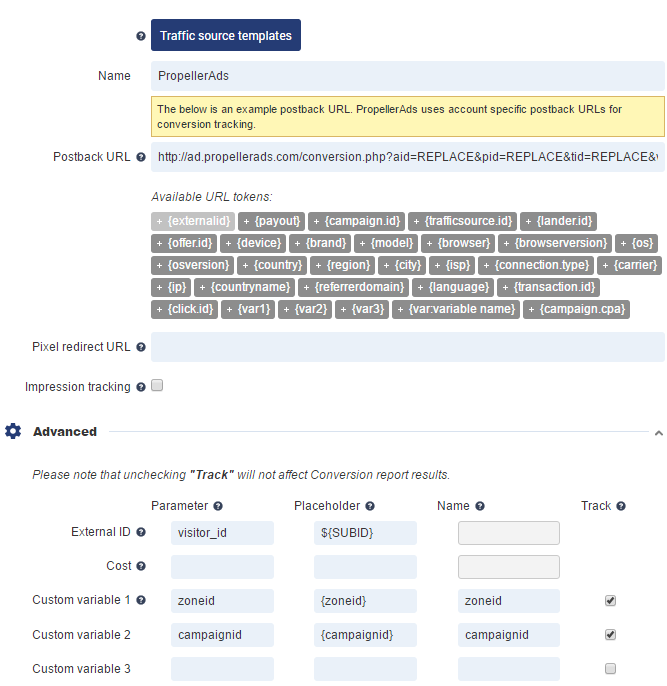 Just select PropellerAds from "Traffic Sources Templates" when adding new traffic source and Voluum will pre-populate all the necessary settings. For more info and step-by-step integration guide please Signup or Login to view earning guides for mobile apps and websites. But never mind, because Signup or Login to view earning guides for mobile apps and websites. is coming up with surprises. We are happy to announce Global Traffic Sale! The minimum CPM bid is $0.5 only! For what? For all GEOs & Targetings! Say you can get Mobile 3G traffic for only $0.5 CPM. Yes, indeed. No doubt about this that propeller ads is one of the finest ads networks besides google adsense.